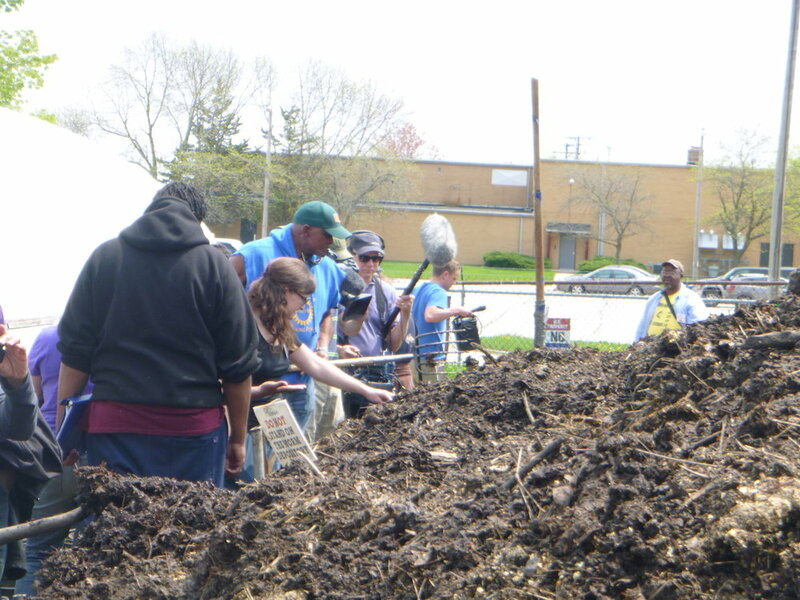 In the inner-city classroom, it is challenging to connect kids to nature and agriculture when their play space is a concrete slab and their food comes processed and served in plastic. Vermicomposting, the breaking down of organic matter with worm power (power as in they take in the food and poop it out), is a fun lesson to teach your students about nutrient cycling, the importance of building soils and waste reduction. Perhaps it could even end with an experiment of growing plants with one group of plants seeded in a typical potting mix and vermicompost added into the other group. Another activity is to pour the bin into a wheelbarrow and let students see if they can find worms, other critters, or worm eggs. The food scraps added could be weighed and quantified as a running number of plant waste not going to the landfill. I think it is apparent that the lesson plans, adaptability, and fun that a teacher may have with a vermicompost bin are full of opportunity...you could even go fishing with the worms! There are plenty of instructions for building these bins online, so instead of being repetitive, here's a link (here's another) to a pretty straight forward article. I used three buckets instead of two so the worms self harvest, because they crawl to the surface for food. Therefore, when I want to harvest the compost (after 1-2 months), all I have to do is put another bucket on top of the current working bucket. This bucket, like the bucket prepared for them to initially live in, will be ready for them to move into complete with organic matter to eat on top. They will realize there is no food left in their current home and crawl up through the drilled holes into their new home. After giving them time to move up, the second bucket can be taken off, worm castings emptied out, and the process can be started all over again. All you really need are containers (you can use plastic tubs instead of 5 gallon buckets), a drill, and some material (like newspaper, leaf litter, etc) to start the bin with! Of course, you also need worms, red wigglers, which I suggest should be looked for by simply asking around. If someone in the area has a worm bin, they will be happy to give some away, as they reproduce fast. If there are no worms to be found, you can have them mailed to you from many different sources online. Top bucket (where the action happens): I put a damp piece of cardboard on the top layer of the highest bucket. I feel as though it creates a fruit fly barrier, and the worms will break down the cardboard over time. Middle bucket: The middle bucket is where your finished compost will be once the worms have been given enough time to migrate up into the top layer. Of course, there will always be some worms hanging out in there so when you are ready to harvest the castings, there are many methods to separate the castings and the worms. With a little creatively, one can get their castings ready for use, and their worms back into the system by using sifters, or even pouring the compost on a well-lit table and scooping off the top layer (the worms dislike light, so they will crawl to the bottom of the table piles). The bottom bucket collects the worm juice, prime stuff for fertilizing your plants! I've worked with vermicomposting as a personal science experiment when I first began gardening in Philadelphia, and then moved on to work with red wigglers on a large-scale during my internship at Growing Power. In fact, vermicomposting is how I found out about Growing Power, and it just so happens they do many other amazing things! My first time using vermicomposting in an educational setting was at a summer camp with various age groups and it was highly successful. There are a few more considerations for starting a bin, such as foods that are okay/not okay, and the proper place to put the bin (mostly for temperature reasons), but I will leave this as a basic introduction! I hope this inspires anyone and everyone to make a worm bin...have fun and happy composting!